I really miss the television show Cold Case. That's kind of what you get in Try Not to Breathe, a novel by Holly Seddon. I say kind of because there is a lot of depth in the characters and the story. After three very emotional events, Alex Dale lost her way. Her journalism job came to a bitter end, and now she has the story that could get her back in the headlines. Fifteen years ago, Amy Stevenson was brutally attacked and left for dead. She's been in a coma since. Alex doesn't feel it is right that the case was never solved. She gets permission to write about Amy. Alex is determined to unravel the truth and find who harmed the then teen. It's not an easy task as the only real witness to the crime is in a coma and cannot speak. That's the main story, but there's also the backstory involving Amy's then boyfriend who is now married, expecting his first child, and hides his past relationship from his wife. There's Alex who has never truly gotten over her own past and has picked up very bad habits since. There's also Amy who is stuck in her coma and wants to speak but cannot. Together, these viewpoints make for a very complex, very powerful cold case mystery and look at the intricacies of human emotions and relationships. Try Not to Breathe is in stores now. Ballantine released it on February 23, 2016. For Amy Raye Latour, hunting in the woods of Colorado is as natural a feeling as breathing. The mother of two spent many years hunting with her grandfather. This is why it's so surprising when she goes out with her compound bow on the final day of hunting season and never returns. Pru Hathaway, a ranger, gets the call regarding the missing woman and heads out with her search and rescue dog. The weather is not cooperating, but worse is that something doesn't feel right. While everyone else believe it is a recovery mission, Pru feels there is more there to this disappearance. She is certain that Amy's too skilled to be another casualty, even if the clues they've been able to find are definitely pointing to it no longer being a rescue. Talk about a very gripping and very addicting story. The chapters in Breaking Wild bounce back and forth between Amy Raye and Pru. While much of the story takes place in present day, both characters do spend time reflecting on their pasts and what made them the women they are today. I started Breaking Wild thinking it would be a good way to relax before bed. Instead, I was hooked and stayed up far too late reaching the final page. The setting is part of the draw. I could feel the bitter cold winds pick up and the snow begin to fall. When the characters heard the yips and howls of a coyote, I could hear them too. The wilderness setting was crafted to make you feel like you're there. I always love finding a new-to-me author whose novels call me to seek out other books and read on. That's exactly what happened with Diane Le Becquets' writing. This is her first adult novel, but she has a few young adult books out there. I was hooked and definitely want to read those young adult novels. Breaking Wild came out in February 2016. It's a Berkley release. Can I just say that The Rain Sparrow, a February 23rd HQN release, caught my eye from the start because of the cover art. I admit to being someone who is drawn to a book based on its cover, and this one pleased me both in terms of the outer shell and what was inside. This is the second novel in Linda Goodnight's Honey Ridge series. It does catch up with characters, as well as the setting, from The Memory House, but it goes well beyond that. Hayden Winters, a bestselling novelist, and Carrie Riley meet under unique circumstances. A late-night storm has Carrie shaking with fear and that same storm is invigorating Hayden. When a child appears in the midst of the storm, afraid to go home but equally afraid of having to tell his story, Carrie and Hayden bond and befriend the preteen. Hayden's bond stems from his own dealings with an abusive parent. As the town librarian, Carrie simply cares for everyone in her town, including this boy who often shows up at the library, eating whatever he can, and staying as late as possible. The more Hayden and Carrie spend with this child, the stronger their own bond grows. Hayden, however, has kept his past hidden and isn't sure he's great material for a long-term relationship, especially with someone as sweet as Carrie. The other aspect of The Rain Sparrow takes place in Hayden's dreams. During his stay at Peach Orchard Inn, he keeps having very vivid dreams that lead him on a quest to undercover the truth about the allegedly haunted mill that's near the inn. Like the first book, this one flips between past and present. The transitions are seamless. I loved catching up with characters from Peach Orchard Inn, and I really loved watching Hayden battle his demons while trying to decide if he was worthy of love. Sometimes, it's so clear to see how much life in the country can affect your views. In the case of the L.A. riots, and many other riots for that matter, I often shake my head wondering how destroying other's property and even injuring or killing another is getting anyone anywhere. Looting an innocent business after an disliked judgment or football game ending, setting fire to other people's cars in protest of police action.... Well, I find it baffling. If you are that upset, run for office and change the laws. It will take time sure, but it's a guaranteed way to get your voice heard and put real change in motion. With that, I'll step down from the soap box. All Involved takes place during the 1992 L.A. riots, the riots that came after the Rodney King verdict. It's a portrait of 17 stories that all link to each other, but showcases a person dealing with his or her own issues. Start with Ernesto Vera. He works in a food truck and dreams of getting out of his neighborhood and into the kitchen of a popular Japanese restaurant where the sushi chef mesmerizes him. His dream will never be realized, however, as he is murdered on his way home from work. When his sister finds out, she sets out to seek revenge on the gang that killed him. This starts a chain reaction as characters share their stories, fight for survival, and do what they feel they must as police and fire crews focus on the site of the actual riots and take far too long to reach the outlying neighborhoods when crimes are being committed. This book is gritty and definitely captured the mood of the times, at least what I know of it from media reports. The more I read, however, the more I did keep asking why. Why couldn't the characters in this book stop for one minute and think about what they were doing. That leads back to my earlier soap box speech. Short of Ernesto and a couple others, I just felt that so many of these characters were experiencing karma and I felt no pity for them. It's sad but true. I felt drawn to the setting and the action, but it was hard liking many of the characters and that made it a very hard read. Ryan Gattis's All Involved was published by Ecco and released in January 2016. You can find it in Amazon and many other retailers. You find out your bedroom closet is hiding a worm hole that allows you to travel anywhere in time. You start going back in time to see music concerts you missed or those you want to see again. That's the reality for Karl Bender. He discovers this worm hole while looking for his missing boot. It's a discovery that changes his life forever. After telling his best friend about the worm hole, the pair start making plenty of money. Unfortunately, Karl accidentally sends Wayne to 980 instead of 1980 and this causes a major issue. In order to travel back, electricity is necessary and there is no electricity in 980. Wayne begs Karl to find an astrophysicist to help get him home. Karl's quest is tough as his is a story that's too absurd to believe, but Lena Geduldig gives him a chance and discovers he's telling the truth. While working on the problem at hand, Lena and Karl begin to fall in love as they also travel back in time. The problem is the temptation to change the past is too tempting. Doing so could destroy everything they've found if they're not careful. Part romance, part sci-fi, and a dose of music history tossed in for fun, Every Anxious Wave ended up being a unique book. At first I feared Mo Daviau's novel would be a little too much of The Time Traveler's Wife for my liking, but it wasn't. It was funny, sad, endearing, and thought provoking all at once, and the romance, while there, does not overshadow anything. If you're looking for something different, give Every Anxious Wave a try. It's a February 9, 2016 release from St. Martins. Generally, I love teen/young adult fiction novels and the plot of Gone Wild was definitely appealing. The story is short, just 176 pages, and took me no more than an hour to read. It flows smoothly, but I never really appreciated the characters enough to really get into the story. After discovering she might be pregnant, 18-year-old Brooke heads out into the wilderness to avoid her nagging mother and her boyfriend while she thinks things through. Tired of being bullied by his mother, his mother's boyfriend, and just about everyone else he can think of, 16-year-old Seth runs away and hitches a ride to the Pacific coast. Seeking refuge in rocks and the woods, Seth is only able to survive by stealing from those camping in the wildernesss. When Brooke finds Seth trying to steal food, she offers to share her food with him rather than end up with nothing. This marks the beginning of a friendship and adventure both will remember. So much of this book's plot seemed unnecessary had either teen used their head. Perhaps it's the way I was raised, but at no point would trekking through the forest have been a better option to sitting down and talking things out. That's why I had a hard time with the characters. They didn't relate well to each other. Seth was petulant at times and therefore unlikable. Brooke was better, but at times too nice given the situation. The setting and details involving camping were realistic, but everything was so rushed that I felt cheated. I never really had time to get to enjoy the setting, characters, or action as it was over before it seems it even began. I was having a pitcher-full and a truth about life and lemonade settled in: Loving lemonade is a choice. I mean, we can’t avoid lemon juice any more than we can avoid challenges. We can fight it, but we are going to lose. Lemon juice will be poured; it’s inevitable. But that doesn’t mean it has to be bitter. We can make a different choice. Sprinkle in a little sugar or Splenda, so to speak, a little water, and we’ve got lemonade, which tastes quite good and, on a hot day, it’s amazingly refreshing. What if we didn’t have a choice. Or the choice wasn’t ours to make. We’d be stuck. Literally swimming in lemon juice without lemonade or a solution or resolution in sight! I didn’t care for the feeling, and it shot holes in my theory that I had at least a little control in my life. Don’t you hate it when that happens? When your illusions are shattered and as leaky as a sieve? I more than didn’t like it, I hated it…but I was intrigued. So I thought about it. Okay, so you have not a pitcher full of lemon juice but a barrel full. You’re already banged up. (Can anyone get to adulthood in life without getting banged up? Unlikely. Rare, even.) So you’re chugging lemon juice from the barrel, eager to drain it and get the nastiness behind you. You’ve deciphered your problems and have progressed to looking for solutions, and you’re feeling good about that because, while the bad stuff isn’t behind you yet, you’ve made progress. You’re on your way to getting rid of it. Only you’re not. You’ve wracked your brain and there just are no solutions. Not even one. Worse, not only have you been robbed of a solution, your choice in what to do has been stolen, too. Now what? What do you do? That was the situation I found myself in that led me to write the Seascape novels, and Beyond the Misty Shore specifically. Being stuck doesn’t exactly inspire you to be in the most receptive frame of mind. Sunshine is arrogant when you’re grieving, right? But isn’t it true that the worst possible time is always when important things happen? When life-changing things happen? That’s been true in my life, and so I made it true in TJ MacGregor’s life, too. He is the hero stuck at Seascape Inn in Beyond the Misty Shore. Add more lemon juice in the form of Maggie Wright, a woman who loves to hate him, and Miss Hattie, the wise Seascape innkeeper (who seems to know everything about everything but won’t just tell anyone anything because “some things are best learned firsthand”), a colorful cast of local characters, Maine cliffs, and a little otherworldly intervention, and, well, T.J. has his work cut out for him, doesn’t he? He did, and so did I. But don’t feel too bad for him. We’ve all tasted the tart of the juice and, you know, sometimes when we’re broken, we have to really hurt to ever get beyond the pain. We have to figure out that we can heal before we do heal. Eventually, we get it. And when we do, magic happens. We no longer just survive. We truly live. Like you and me, he’ll figure it out… eventually. So will Maggie. And what fun to watch without personally sucking lemons! I’m getting a little misty here. I think I’ll pack a bag and go visit Seascape Inn again . . . just as soon as I finish this glass of lemonade. Care to join me? 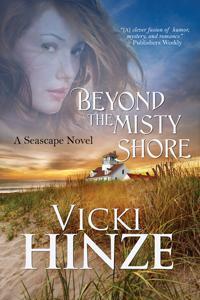 Vicki Hinze’s Seascape Trilogy is on sale through March 1st! Pick up these paranormal romances today! Beyond the Misty Shore – Free! Whimsy. Serenity. And a Touch of Magic. The Seascape Inn. Marketing executive Maggie Wright and artist T.J. MacGregor are linked by a mysterious car accident that killed Maggie’s cousin, Carolyn, T.J.’s fiancée. When Maggie arrives on the Maine coast determined to get answers from T.J., she discovers a tortured man who is bound to the Seascape Inn by supernatural forces. Despite the tragedy that stands between them, Maggie and T.J. begin to fall in love, seeking answers and a healing spirit they may never achieve. Upon a Mystic Tide – Only $1.99! With their painful divorce looming on the horizon, radio psychologist Bess Cameron and her soon-to-be-ex-husband, John Mystic, meet at Maine’s Seascape Inn to finalize the terms of a property settlement. Bess believes John is in love with someone else, and she’s determined to move on without him. Their marriage appears doomed until the Inn’s matchmaking ghost, Tony, and its irrepressible owner, Miss Hattie, take matters in hand. Sometimes you have to leap upon a mystic tide and have faith the sand will shift and an island will appear . . . 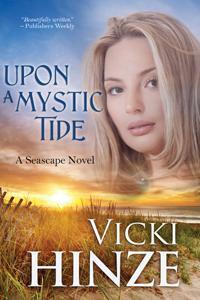 The second book of bestselling author Vicki Hinze’s Seascape Trilogy brings readers back to the gentle magic of a place where love is always stronger than the fragile boundaries of life. 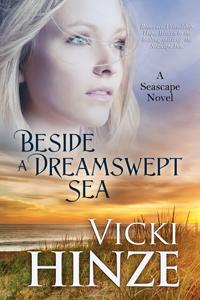 Beside a Dreamswept Sea – Just $5.99! New love isn’t on the agenda for widower Bryce Richards, who comes to the peaceful Seascape Inn with his three children, hoping the ethereal setting will help them recover from the death of their mother. Likewise, fellow inn guest Callie isn’t looking for romance either; she’s recovering from an emotionally abusive marriage. It will take all the matchmaking skills of innkeeper Hattie Stillman and her ghostly assistant to bring Bryce and Cally together. Raised in New Orleans, Vicki Hinze began writing before Kindergarten but her journey to writing books included a lot of corporate pitstops. Eventually, she settled in and her first novel landed an array of awards and on the bestseller list. With nearly 40 books published, she's been back many times with awards in multiple genres and appearances on multiple bestseller lists, including USA TODAY. Vicki is recognized by Who's Who in the World as an author and an educator and is best known for chilling suspense, trailblazing, and creating series that genre-blend. Her works include suspense, mystery and romance. Since 1994, this former VP of International Thriller Writers has written heavily about military and military families and in nearly all genres except horror. Hinze is a Floridian married to a former Hurricane Hunter/Special Operations Officer. She constantly pushes the boundaries on existing genres, opening the door for new novel blends. I have one very important suggestion, have Kleenex on hand before you begin The Feathered Bone. This book seriously takes you on an emotional roller coaster, an outstanding read, and a story that I had to digest in sections because there were times it was overwhelming. Amanda Salassi and her friends are chaperoning their 12-year-old children's field trip to New Orleans. It's a trip meant to teach the class about Mardi Gras and its history. Everyone is having a blast until Amanda's daughter's best friend vanishes. This is a tight-knit group and all are affected. Amanda feels guilt at having listened to the girls ask her to let them at least go to the bathroom without a chaperone hovering. Amanda's daughter feels guilty for not seeing exactly where Sarah went during the bathroom trip. Beth, Sarah's mother, feels guilty for having bowed out of the field trip early. The teacher feels guilty for losing a student during a class trip. Even the school bus driver feels guilty for not having returned all students back to the school. As the search for Sarah kicks into high gear, Hurricane Katrina also hits. No one in the community will be the same. For Amanda, her daughter, and even Amanda's husband, their lives are deeply affected. For Beth and her husband Preacher, their faith falters and leads them to question everything the Bible's taught them. That's the basic premise of the book without giving away any spoilers. The story is interlaced with letters from Sarah, so the reader is kept up to date with Sarah's situation, but much of the focus remains on how each character copes as they continue the search for Sarah, deal with the aftermath of Hurricane Katrina, and try to deal with their guilt. There are so many layers to Julie Cantrell's powerful book that I did have to take breaks. Twists in this novel were completely shocking, so I felt each blow almost as much as the characters did. The Feathered Bone is a work of Christian fiction, though even with the biblical references I never felt that it was preachy, as some Christian fiction can be. Instead, it explored characters' beliefs with realism that helped paint a complex picture of faith and trust. I loved this story and the characters as a result. Amanda is a counselor and sees a number of patients who are coping with situations ranging from depression to suicide and verbal abuse to domestic assault, that's part of the reason this book is tough on the emotions. This Thomas Nelson release came out on January 26, 2016. It's ideal fodder for book discussions and a story I consider a must-read, especially if you like Jodi Picoult and other novelists who do not gloss over the hard facts of today's world. I've fallen for Mary Kubica's books. It's not that they completely fool me, but the characters and mystery do draw me in and leave me contemplating what I've read for days, if not weeks. Pretty Baby is another gem, though this one I predicted more of the story than I usually do with her novels. Heidi is perhaps a little too caring. As she waits for the train, she spies a young girl carrying an infant. She's certain the girl is homeless, which means the infant is too. Heidi keeps watching for them and eventually invites the girl to come have a meal at a local diner. This leads to Heidi inviting the girl to come stay at Heidi's home with Heidi, her husband Chris, and their daughter Zoe. Let it be known that Zoe and Chris are far from thrilled with the idea of having a homeless girl and a crying infant as new housemates. Willow has nothing more in her life than her baby Ruby. She's seen some hard times and isn't exactly warm to the idea of moving in with strangers, but the promise of shelter from the incessant rain, meals, and help for Ruby is not to be ignored. Willow moves into the home where two of the three within the home simply do not want her or Ruby there. Chris is constantly on the road and not thrilled that he rarely gets to see his wife and daughter anymore. When he learns Heidi has taken a liking to Willow and Ruby, he's having a hard time understanding Heidi's motives. Who invites a stranger into a home where you have a child to keep safe? Are Chris's instincts a product of his imagination and guilt that he's rarely around or is Willow dangerous? Now here's the thing with Mary Kubica's Pretty Baby, I liked all three characters from the start. The story is told from Chris, Heidi, and Willow's perspective. Willow I wanted to hug. Heidi, well I kind of wanted to hug her too at times. Chris was probably the least likable of the three, but even then my opinion of him changed greatly. This is a complex story and even a bit of a character study. I've been (partiallly) in Heidi's shoes, so I could get her angst. Willow is, sadly, a lot like a girl I knew in high school, so I felt a connection there. As the pair do what they feel is best for Ruby, I understood the highs and lows. As the "surprise" twists started to come into play, I really didn't find them surprising. Most of the story I'd guess early on. That never detracted from the story though. I just didn't feel the shock that some readers might encounter. Originally released in hardcover in 2015, this is the first paperback run for Pretty Baby. Look for it starting tomorrow anywhere MIRA books are sold. Also, look for my review of her upcoming Don't You Cry closer to that novel's May release date.